Rice is easy. Rice is cheap. Rice is quick. Rice is good. Given this, I am not sure what compelled me to take this product off of the shelf for testing. 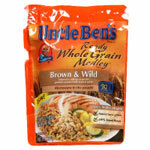 I had low expectations, because a pound bag of long grain or brown rice is only about $2.00 and it's a snap to cook. You put rice and salt and water in a pan and 15 minutes later you have rice. 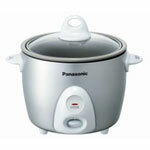 Even easier, a rice cooker will do the work for you flawlessly every time and you can buy them for as little as about $20.00. I guess the challenge, of whether $1.89 for a bag of instant rice that serves two would actually be any good, was just too much for me. Well, my low expectations were met almost to perfection. Holding the package I envisioned gummy, slightly over cooked rice. I was intrigued that the Whole Grain Brown and Original Long Grain had no added salt. The Long Grain and Wild variety and the Roasted Chicken Flavored, I figured, would have that salty fake chicken bouillon cube taste. Exactly! The brown and long grain were gummy and slightly overcooked, truly tasting of cardboard (not that I eat cardboard all that often). One taster suggested we add salt. Using 1/4 teaspoon (enough to make it about 300 mg per serving) simply made these taste like salty cardboard. The other two were also as expected. Gummy, overcooked, salty, fake flavored rice. Read it online at http://www.drgourmet.com/newsletter/reviews/062907.shtml | Read more reviews.